While many soldiers can claim to have “remarkable” careers, few match the achievements in uniform of John Liu Fugh. Born in Beijing, China, in 1934, Fugh came to the United States as a teenager in 1949. After graduating from law school, he joined the Army in 1960. 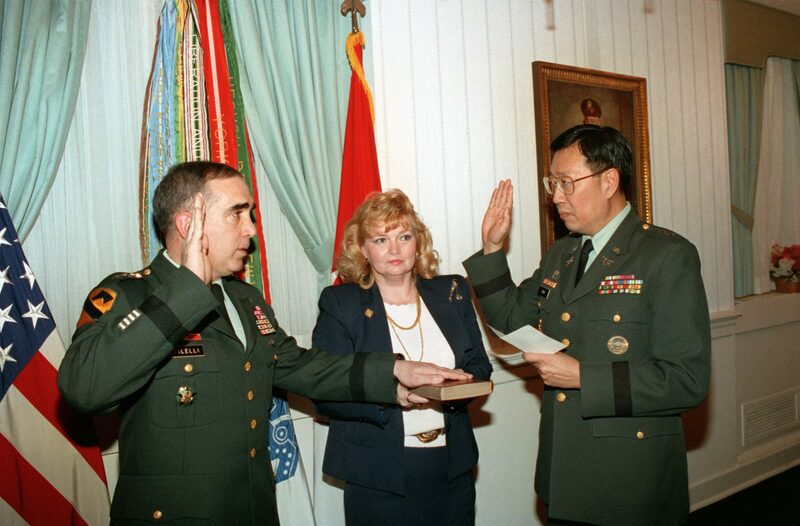 For the next thirty-two years, Fugh soldiered as an Army lawyer and made history in 1984 as the first American of Chinese ancestry to reach flag rank. 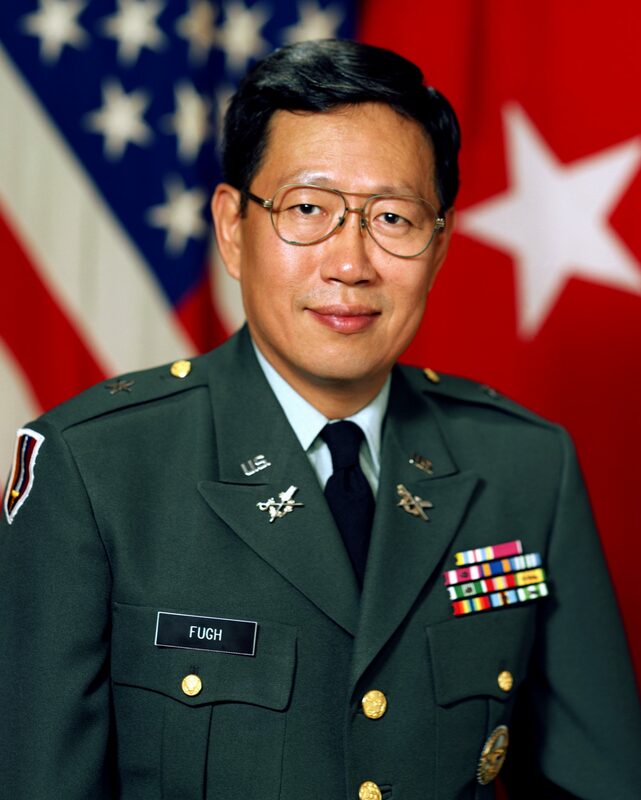 When Major General Fugh retired from active duty in 1993, he was the top lawyer in the Army and one of only two Chinese-Americans to reach two-star rank. This is the story of his life and career. A native of Beijing (Peking), John Liu Fugh was born on 12 September 1934. The Fugh family was related to Chinese royalty by blood, giving the family a higher status in Chinese society. They also were third-generation Christians, which explains why his father, Philip, became the private secretary to Dr. John Leighton Stuart, a well-known Presbyterian missionary educator. Stuart was American (his family members were Southerners from Alabama), but he had been born in China and was fluent in Chinese. He needed a Chinese assistant, especially after founding a Christian university, Yenching University, in 1919. 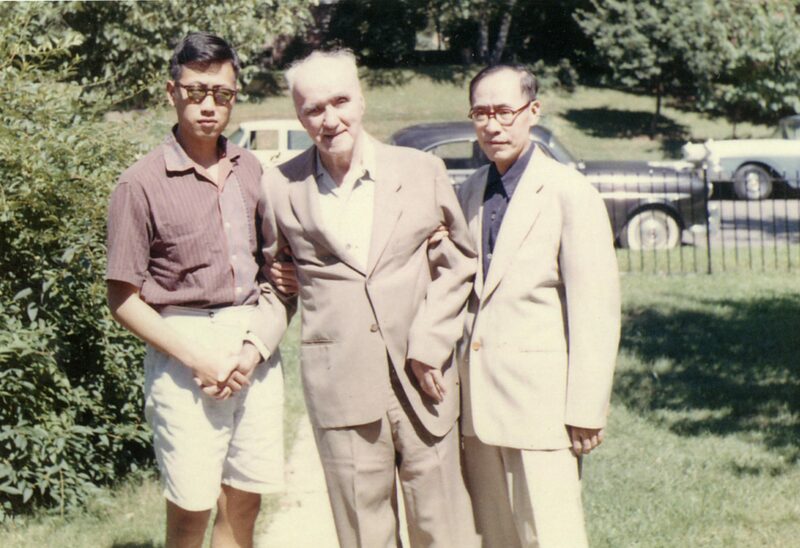 Philip Fu was the perfect choice, for he had attended Yenching, spoke English well, and was a Christian. Philip remained with Stuart as Yenching grew into one of the top universities in China. After traveling to the United States in the 1920s with Dr. Stuart, Philip Fu added “gh” to the spelling of the family name years later, so that it became “Fugh, ” which he believed would be more acceptable to English-speaking Americans. Having received permission to come to the United States, the Fughs traveled by ship to Japan and Hawaii, and then reached San Francisco. It was 1950, and 16-year old John Fugh spoke little English, but his parents were determined to make a new life for him and placed him in a private school in New Rochelle, New York. He boarded with a woman and her daughter (both Americans) who lived near the school. With no family members around, it was a very lonely existence. Meanwhile, Fugh’s parents had settled in Washington, DC, with Philip Fugh serving as Ambassador Stuart’s private secretary. Having learned enough English, young Fugh enrolled in Western High School in the Georgetown neighborhood of Washington. After graduating in 1953, he entered Georgetown University’s School of Foreign Service. Fugh’s plan was to remain a Chinese citizen and then join the Chinese diplomatic service. When he graduated with a B.S. in International Relations in May 1957, however, Fugh realized that this was not going to be possible, as mainland China was not going to welcome him and he had no connections to the Nationalist government in Taiwan. A career as a diplomat in the U.S. State Department also was not open to him; although Fugh was about to be naturalized as a U.S. citizen, one had to be an American for at least ten years before one could apply to take the Foreign Service examination. This citizenship conundrum existed because of the manner in which the Fugh family had come to the United States. Initially, they had temporary visitor status and had to renew their visas every six months. 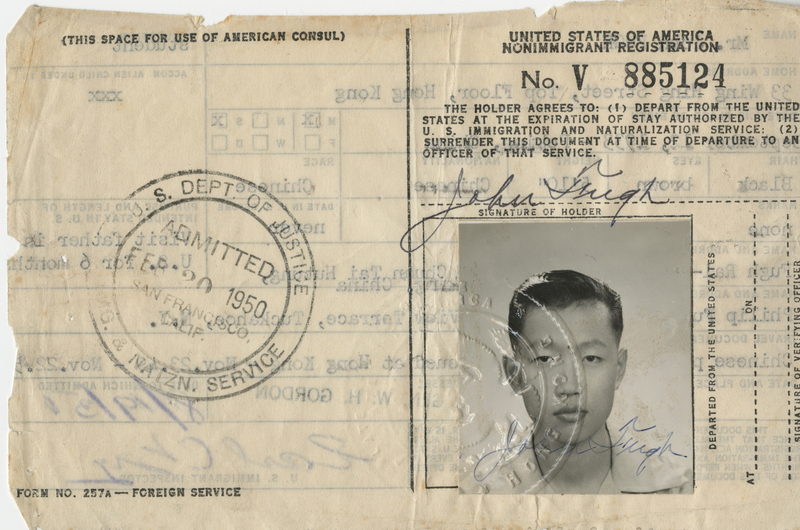 In June 1952, however, with the help of Ambassador Stuart, Congress passed a private bill that gave the Fughs “permanent residence” status, starting the five-year period after which they could apply for citizenship. 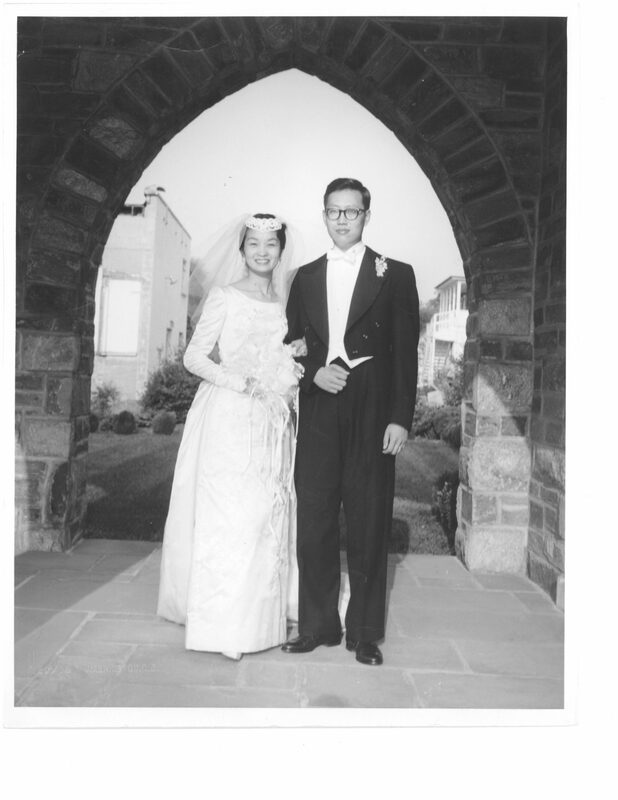 John Fugh did, in fact, become a naturalized citizen in 1957. However, not having being able to sit for the Foreign Service exam, and with no practical skills, he decided to go to law school at George Washington University. In 1961, First Lieutenant Fugh completed eight weeks of infantry officer training at Fort Benning, Georgia, and then reported to The Judge Advocate General’s School in Charlottesville, Virginia, for the basic course in military law. He graduated in May 1961 and went to his first assignment: Sixth Army at the Presidio, San Francisco. He did the usual legal work for a young JAG officer: defending soldiers at courts-martial, and reviewing reports of survey and line of duty investigations. As for the unusual, Fugh was the legal advisor to a board of senior officers appointed to inquire into the capture of two Army aviators by North Korea. In early 1964, two Army pilots, Captain Ben Stutts and Captain Carlton Voltz, were on a mission over the Demilitarized Zone when they mistakenly crossed into North Korea. After developing engine trouble, the two men decided to land their helicopter, not realizing they were on North Korean soil. They were taken prisoner and, after being interrogated, gave much more information than “name, rank and service number.” They eventually admitted under pressure that they had been on a spy mission. When the Americans were released after several months in captivity, a fact-finding board was convened to investigate whether the two officers had violated the Code of Conduct while prisoners and whether any such violation was a criminal offense. After two months of testimony, the board concluded that the two men had committed no crimes under the Uniform Code of Military Justice and were blameless. Although Fugh relished the camaraderie in the legal office and liked the military lifestyle, pay was low. As a result, Captain Fugh left active duty at the end of his three-year commitment to take a job as an attorney with the Atomic Energy Commission in the San Francisco area. By this time, Fugh was married to the former June Chung and had an infant daughter, Justina. Civilian life in Berkeley was good, but Fugh missed the Army. He missed the “culture” and the “cohesiveness and togetherness” that was lacking in his civilian job. After his old boss at Sixth Army encouraged him to return to the Army if he felt that something was missing in his life, Fugh did just that, returning to the JAG Corps in November 1964 after a six month break in service. He came back on active duty with a Regular Army commission and a tour of duty at U.S. Army Europe (USAREUR), in Heidelberg, Germany. The only downside to his Germany experience was that Fugh tired of being thought of as Japanese. There were still Germans of a certain mind-set who remembered that the Third Reich had been allied with Japan in World War II. Thinking that Fugh was of Japanese ancestry, some believed he was a kindred spirit. Initially, Major Fugh, having suffered through the Japanese occupation of China as a boy, would correct the Germans and inform them that he was Chinese. After a while, however, tired of having to constantly repeat himself, he simply stopped. In September 1967, now Major Fugh returned to Charlottesville, Virginia, to attend the year-long Advanced Course for Army lawyers. After graduating in May 1968, he deployed to Vietnam. 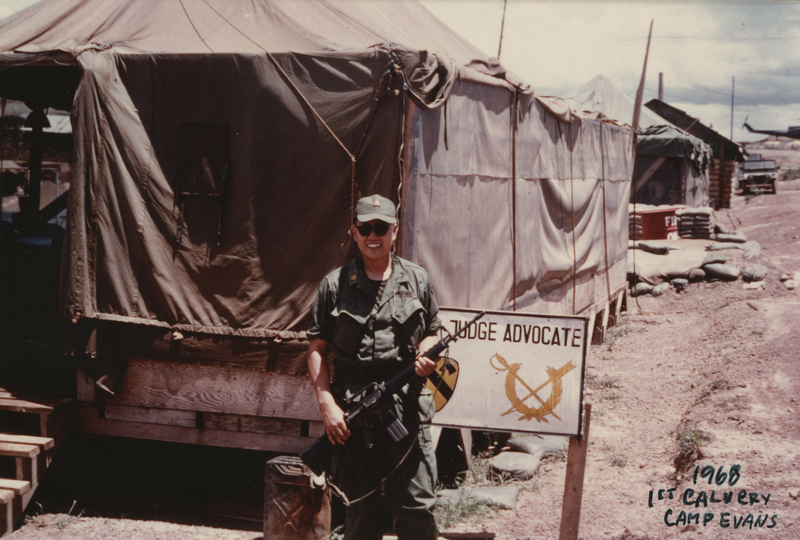 Assigned to U.S. Army, Vietnam (USARV), Fugh served as the Deputy Staff Judge Advocate and Chief, Civil Law Division. This latter position meant that he had overall responsibility for all legal matters at USARV except for military justice and foreign claims. Fugh advised on the Geneva Conventions, labor contracts, real estate and currency controls, and personnel claims. The work tempo was fast; Fugh worked seven days a week, with only Sunday afternoons off. Nevertheless, Fugh understood that he had it easy, compared with judge advocates in the field. On one occasion, he accompanied the USARV Staff Judge Advocate on a trip to the 101st Airborne Division, then located at Camp Eagle near the Demilitarized Zone. After the USARV lawyers arrived, they had difficulty finding their 101st counterparts, as there were no permanent structures at Camp Eagle apart from “a shack used as the PX.” Finally, Fugh found the SJA office, which “was a CONEX container half buried in the ground with a tent in front of it.” There was a small wooden sign at the tent entrance that read “SJA.” Fugh walked in, but it was impossible to tell who was an officer or who was enlisted because everyone was bare-chested in the intense tropical heat. As Fugh remembered it, he had brought a six-pack of Coke, and this “small gift” was very much appreciated. “It was a poignant visit. Here I was sitting in air-conditioned USARV offices while my colleagues worked under these severe conditions,” he said. To get a better understanding of what troops in the field were experiencing, Fugh also volunteered to serve as part of the aircrew on helicopters flying combat support missions; he was awarded the Air Medal for “actively participating in twenty-five aerial missions over hostile territory” between January and May 1969. 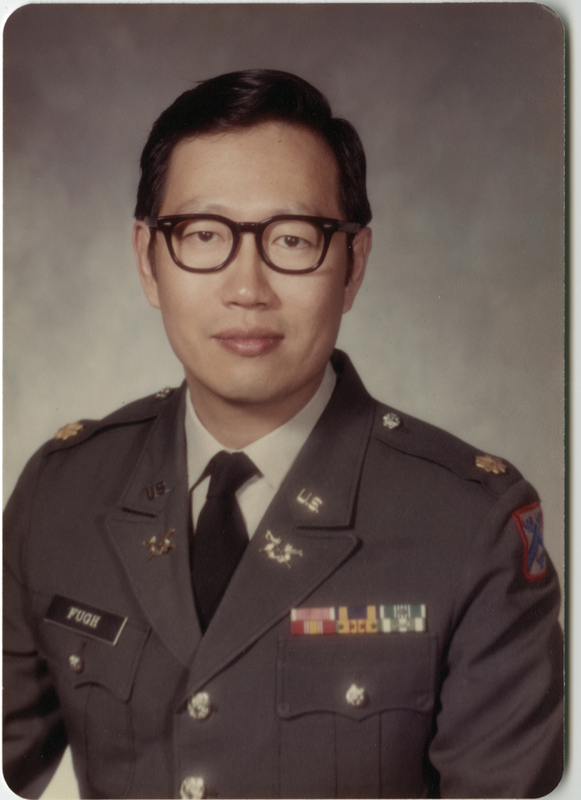 While his year in Vietnam was a positive experience, Fugh was bothered by “the way our troops viewed the Vietnamese.” Given his Chinese background, he did not like the term “gooks.” As he put it, “I understand we were fighting a war, but I think there was also a racial component.” Fugh remembered one case where a soldier had killed a South Vietnamese civilian while driving recklessly, yet received only non-judicial punishment under the Uniform Code of Military Justice. In another case, soldiers on sentry duty saw an old Vietnamese man on a bicycle and decided “to take him out.” The men shot and wounded him, and then killed him. “They viewed the Vietnamese as though they were not even human. Being an Asian, that bothered me,” said Fugh. After Vietnam, Fugh got his dream assignment—serving with the Military Assistance Advisory Group (MAAG) to the Republic of China. While in Vietnam, Fugh had been to Taiwan on temporary duty and, after arriving at the airport in Taipei, was surprised that he could understand everything that was being said by the Taiwanese officials, who spoke Chinese rather than Taiwanese. As a result, Fugh asked for an assignment to the MAAG Taiwan. Initially, this request was refused because, as his assignments officer told Fugh, “We don’t send Frenchmen to France.” This seemed to be a foolish perspective and Major General Lawrence Fuller, the number two lawyer in the Army, agreed. Fuller approved Fugh’s assignment to Taipei as the MAAG staff judge advocate. This was a big deal—the incumbent was a full colonel; Fugh would be replacing him, yet he was still only a major. From the beginning, Fugh’s experience was quite remarkable. He not only understood the language, but the culture as well. As for the Taiwanese, they were unsure about this American Army officer. At a cocktail party, for example, Fugh was talking with a Taiwanese woman in Mandarin. After some time, she said to him: “Tell me, are you with us or with them?” Fugh’s reply: “I’m with them.” Later, when Fugh participated in negotiating sessions with the Taiwanese authorities, he realized that they were whispering among themselves because they were concerned that he might overhear their conversation. Although he was in Taipei to provide legal support, Major Fugh’s unique talents caused him to be heavily involved in negotiating a variety of agreements with the Ministry of National Defense. Fugh also often accompanied the MAAG commander, an Army major general, when the latter would give a speech to ensure that the talk was translated accurately. After a very successful three years in Taiwan, Fugh attended the Command and General Staff College at Fort Leavenworth, Kansas. 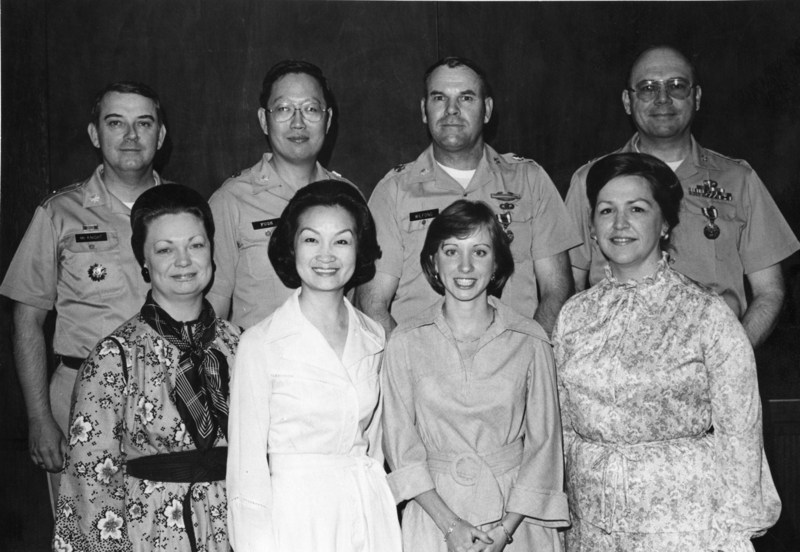 After graduation in May 1973, newly promoted Lieutenant Colonel Fugh reported to be the Staff Judge Advocate and Legal Counsel for the Ballistic Missile Defense Office in Arlington, Virginia. In this assignment, he worked on a variety of very high-level procurement issues involving not only missiles, but also phased-array radar and supporting equipment, as well as installation facilities. In 1976, Fugh returned to Germany as the Staff Judge Advocate, 3d Armored Division. This was a plum assignment, but Fugh was apprehensive because while his expertise was in procurement, administrative, and civil law, the division was a “heavy-duty military justice” operation. Additionally, while Fugh had previously served as the top Army lawyer in an organization, MAAG Taiwan, that earlier assignment had been in a small office while the 3d Armored Division job involved providing legal services to some 29,000 soldiers and supervising one major and thirty captains in six different offices. Fugh, however, quickly established a good rapport with Major General Charles J. Simmons, the 3d Armored Division commander. In Fugh’s view, part of his success was due to his insistence, which he communicated at regular meetings to the captains in his legal operation, that they “do what’s right” and adhere to the highest professional and ethical standards. At the end of his assignment, Simmons frequently (and publicly) identified Fugh and his Inspector General as the two officers he valued the most on his staff. I’m not saying that you’ve got to be political in giving an answer. What I’m saying is that your answer must be legally correct, but more important is how you present it. You can guide your listener to the right decision without sounding confrontational or argumentative about it. In 1982, now Colonel Fugh became the Chief of the Army’s Litigation Division. This was an immensely important job, and very challenging, as Fugh represented the Secretary of the Army in federal court litigation. He had overall responsibility for ten divisions: contract law, civilian personnel law, litigation; procurement fraud (which he established), environmental law (which Fugh also stood up), contract appeals, defense appeals, trial defense service, regulatory law, and intellectual property. Success in this position certainly accounts for Fugh being promoted to brigadier general on 1 August 1984. This was a historic occasion for the U.S. Army, marking the first time in U.S. military history that an American of Chinese ancestry had reached flag rank. At this time, just as today, there were very few Chinese-Americans in uniform. According to Fugh, this was the result of a bias against military service in Chinese culture. Those Chinese who desired a career with the government in imperial China, for example, looked for positions as civil servants. “Good iron is not used to make a nail, nor a good man to become a soldier” was an old Chinese proverb, and Fugh believed this explained why a “good man” would seek to be a civilian official rather than a soldier. His military career, he readily admitted, was an anomaly. With one star on each shoulder, Fugh now assumed duties as the Assistant Judge Advocate General for Civil Law. In this new job, he expanded the role of Army lawyers by helping establish a one-year fellowship program at the Department of Justice and arranging for experienced judge advocates to be appointed as Special Assistant U.S. Attorneys to prosecute felonies in U.S. District Courts near large Army posts, such as Fort Bragg, North Carolina. In July 1988, Brigadier General Fugh returned to China for the first time since he had fled with his mother in 1949. He accompanied General Max Thurman, who was then commander of U.S. Army Training and Doctrine Command, and who would later serve as Army Vice Chief of Staff. The purpose of the trip was to have greater military-to-military contact with the People’s Liberation Army. Just as he had experienced when assigned to MAAG Taiwan, the Chinese questioned Fugh’s allegiance. In Shanghai, a young woman asked Fugh in Chinese why he was wearing an American uniform. “Are you a counterfeit? Are you a fraud? If there’s a war between China and the United States, which side will you be on?” she inquired. Fugh stopped, looked at her and replied, “Which side do you think I’ll be on?” That was the end of the conversation. In May 1989, Fugh was nominated to be a major general and to serve as The Assistant Judge Advocate General. Major General William K. Suter, then serving as The Assistant Judge Advocate General, was nominated to be The Judge Advocate General. Personnel glitches at the brigadier general-level in the JAG Corps also meant that when Fugh pinned on his second star, there were no more judge advocate one-stars. When Fugh had been nominated for a second star, this triggered the retirement of his fellow brigadier generals who had not been selected for promotion. Therefore, since no colonels had had been selected and confirmed to be brigadier generals, Fugh was the lone active duty general officer in the JAG Corps. Consequently, during Operations DESERT SHIELD and DESERT STORM (August 1990 to February 1991), while officially acting as the number two lawyer in the Army, Fugh was wearing all the general officer “hats” in the JAG Corps. In the high operational tempo of combat operations in Southwest Asia, Fugh got a number of novel questions at all hours. Late one evening, for example, the Deputy Chief of Staff for Personnel asked Fugh if there would be an “environmental problem” if the Iraqis used chemical or biological weapons against U.S. troops, and if the remains of those killed by such weapons were transported to the United States for burial. When an Army UH-60 was shot down over Iraq and its crew taken prisoner and paraded on Baghdad television, the Defense Department’s top lawyer called Fugh on a Sunday morning to get advice on the applicability of the Geneva Conventions to this event. Fugh was also asked about decisions made by judge advocates in the field. He received a telephone call in the middle of the night from a Marine brigadier general in Saudi Arabia. This officer was calling on behalf of General H. Norman Schwarzkopf, the commander of U.S. Central Command (CENTCOM) and leader of coalition forces against Iraq, who was questioning legal advice provided by Colonel Raymond P. Ruppert, the top lawyer at CENTCOM. The issue was whether a statue of Saddam Hussein, located in a prominent park in Baghdad, could be targeted by coalition aircraft. This was prior to the start of the ground war, but the air campaign was under way and there was a great desire on the part of “our pilots” to “take it out.” Ruppert, however, advised against destroying the statue; he argued that it was not militarily necessary and would arguably constitute a violation of the law of armed conflict. The Marine general officer wanted to know if this was good legal advice. As Fugh remembered it, when he arrived in the Pentagon a few hours later, he studied some aerial photographs of the statue in the park and the surrounding area. There was no question that Colonel Ruppert was correct. Fugh then made a telephone call to the Marine brigadier general to confirm both the legality and wisdom of Ruppert’s legal advice, but he made sure that this call was placed to Saudi Arabia in the middle of the night. Less than two months after the 100-hour ground war with Saddam Hussein ended in late February 1991, Fugh was elevated to be The Judge Advocate General on 2 April 1991. He subsequently implemented a number of changes in the JAG Corps. One was a new policy on term limits: judge advocates serving as either The Judge Advocate General or The Assistant Judge Advocate General (today’s Deputy Judge Advocate General) were limited to four-year terms. As a result, the Assistant TJAG could not “flight up” to become the TJAG. Additionally, any judge advocate one-star not selected for promotion was required to retire. In Fugh’s view, these reforms were necessary to ensure that deserving colonels had opportunities for promotion to flag rank—opportunities that were limited when one person could be the number two lawyer in the Army and then move up to the top spot. Fugh also decided that the time had come to better integrate Army Reserve lawyers into the active duty JAG Corps. There had been no overseas deployment of Army Reserve troops for many years (Reservists did not participate in the Vietnam conflict). Yet, of the more than 270 judge advocates who had deployed to the Persian Gulf region in 1990, one-third was from the Reserve. Recognizing the important contributions of these reservists, and understanding that they would play important roles in future military operations, Fugh directed that the Corps’ worldwide legal conference, previously restricted to active duty judge advocates, now include Army Reserve and National Guard lawyers. Finally, for the first time in JAG Corps history, Fugh spearheaded efforts to create a vision for the Corps. He wanted “a succinct statement that would inspire, be clear and challenging, be about excellence, stand the test of time … be a beacon to guide us, and empower our people.” As a result, in April 1991, Fugh approved the following vision for the Corps: “To be the most competent, ethical, respected, and client-supportive group of legal professionals in public service.” Almost twenty-five years later, this vision for the delivery of legal services in the Army very much remains in place. Fugh retired in 1993 after two years as The Judge Advocate General. He could have stayed in this position until 1995, but decided that “it was time to go because…the JAG Corps needed new leadership.” Upon his retirement, he was awarded the Distinguished Service Medal by Army Chief of Staff General Gordon R. Sullivan. Fugh joined a large law firm but, after less than a year, was hired by McDonnell Douglas to head up its operations in China. It was the perfect position for John Fugh, given his background and expertise. He and his wife June took up residence in Beijing in August 1995, and Fugh began working with the Chinese aviation community. Since McDonnell Douglas wanted to sell passenger aircraft to the Chinese airlines, this was the chief focus of Fugh’s work. After Boeing acquired McDonnell Douglas in 1997, Fugh left the aviation industry for a new job: Chairman of Enron-China. At the time, Enron was heavily involved in building natural gas pipelines and power stations in China. After returning to the United States in February 2000—after four and a half years in China—Fugh worked in Enron’s Washington, DC, office, where he lobbied for trade legislation that would benefit the U.S. business community in China. After his retirement from Enron in 2001, Fugh “deepened his involvement with the Committee of 100, an elite Chinese-American advocacy organization,” and ultimately served as the chairman of the group. During this time, Fugh also worked to fulfill a long-held desire to have Ambassador Stuart’s ashes buried on Chinese soil. Since it was Stuart who had made it possible for the Fughs to begin a new life in America, John Fugh believed that it was only fitting that he work to repatriate Stuart’s remains to China, which Stuart himself desired since he had been born in China in 1876. John Fugh died at the National Naval Medical Center in Bethesda in May 2010, aged seventy-five. Given his remarkable life, from teenager in China to the top uniformed lawyer in the Army, he is not likely to be forgotten, especially among the Army JAG Corps. 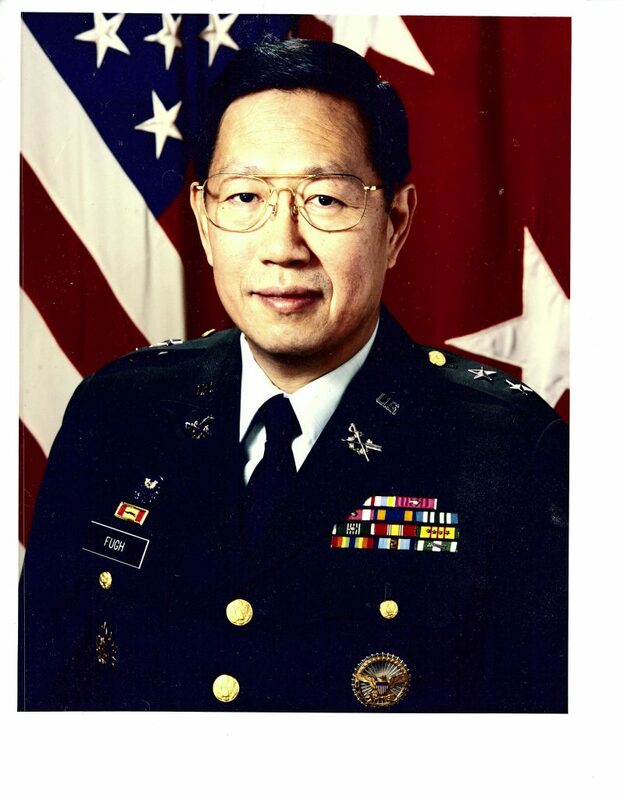 Major General Fugh will always be the first American of Chinese ancestry to reach the stars. He also will be remembered every other year at a two-day JAG Corps symposium named in his honor. At this gathering, held at The Judge Advocate General’s Legal Center and School in Charlottesville, scholars and practitioners from around the world come together to discuss current legal issues in military operations—a fitting acknowledgement of Fugh’s significant contributions to military law.